The Securities Commission Malaysia (SC) has announced that it welcomes new applications for Equity Crowdfunding (ECF) and P2P lending. This follows their previous call for more industry participation during their Annual Report press conference earlier this year. This announcement signals Securities Commission Malaysia’s continued interest to use alternative investment platforms like Equity Crowdfunding (ECF) and P2P lending to democratise access to investments. 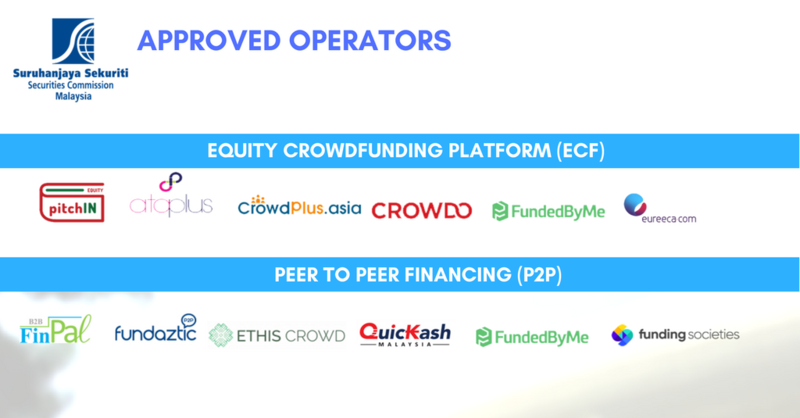 To date there are 6 approved operators under the Equity Crowdfunding (ECF) category and similarly 6 approved operators under the P2P lending category. Applicants have by 7 September 2018 to submit their documentation for registration. The Equity Crowdfunding (ECF) and P2P lending platforms have shown relative success having conducted 1,000 successful campaigns to raise a total of RM118 million worth of capital. This has benefited more than 300 micro, small, and medium enterprises (MSMEs) in the country thus far. Based on a previous report done by Fintech News Malaysia, Pitchin is seen to be leading the Equity Crowdfunding (ECF) segment, while Funding Societies is seen to be leading the P2P lending category.